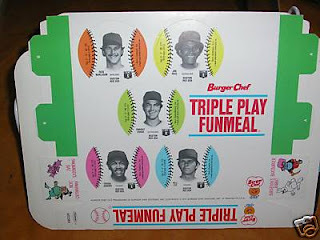 In 1977, MSA teamed up with the fast food chain Burger Chef to create "Fun Trays" for kid's meals. For those way too young to know (or not in the geographic location to know), Burger Chef (at least in the recollection of my childhood) was the ugly stepchild to Mcdonald's and Burger King. The food was cheaper in every sense of the word. But, for a kid growing up outside of Pittsburgh, it was the place we would go for a 'treat' BECAUSE it was cheap. 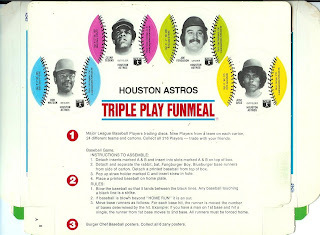 The Burger Chef "Fun Meals" were the equivalent of "Happy Meals." They were fun, not necessarily happy. 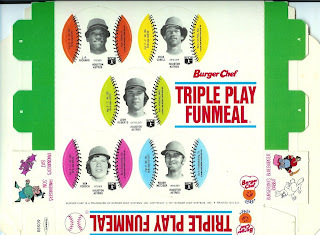 In an effort to create some happiness for the kiddos, Burger Chef served their meals in trays that featured punchout discs with baseball players on them. There were 24 trays in all, featuring the stars of the teams included on the tray. All tolled, there are 216 cards in the set (a list of players by team appears at the end of this post, supplied by www.teamsets4u.com). The teams included Rangers, Astros, Cardinals, Red Sox, Orioles, Twins, Indians, Royals, White Sox, Brewers, Tigers, Giants, A's, Angels, Padres, Mets, Dodgers, Expos, Phillies, Yankees, Pirates, Cubs, Braves, and Reds. You can find individual discs if you look, but I actually found the whole unpunched trays easier to locate. As a baseball card collector, there is nothing quite like pulling a "hit" from a pack of cards. Jersey swatches, pieces of bats, autographs, or anything that brings me closer to the game is a welcome addition to my collection. Pulling one of these memorabilia cards is always a thrill for me. Heck, even when I buy a box of cards with guaranteed "hits", I still get excited when they show up. If I had to estimate, I would say that I have opened over ten thousand packs of cards in my life. Granted, before 1990 there was not much in the way of "hits" you could pull from a pack. Nonetheless, in the last nearly twenty years I have had plenty of opportunity to pull autograph and jersey cards. I posted them over on my PunkRockPaint Blog if you want to see.